On this page you will find a compilation of information we have gathered, and believe to be true, from various sources that is intended to enlighten, and hopefully evoke a further softening of the heart towards all of God's creatures. We have linked these references for the reader's convenience and further investigation. Most people's mental image of Egg Production is that of a farmyard in which chickens are free to roam about, to fly, and to even roost in the trees. To the side of the yard is a chicken coop, where the chickens are free to enter, to leave, and to nest and lay their eggs. Then each day the farmer comes out with his or her basket and collects the eggs for market or personal use. While such a situation may exist on some individual small farms, nothing is further from the truth when it comes to the vast majority of farms engaged in commercial Egg Production. Additionally, many ethical vegetarians believe that the eating of eggs is ok as it doesn't cause the death of the chicken. A Victory for Farm Animals? Are Organic Poultry/Eggs Even Possible? 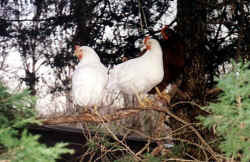 Backyard Chicken Flocks...Is It Really a Good Idea? Battery Hen By Ashia T.P. Chickens and eggs – what about the males? Chickens Flying High – Literally! Eggs: What Are You Really Eating? Gas Chambers – The 'Humane' Alternative? Helping Chickens "Cross to the Other Side"? How many animals really suffer to death? How Mom-Friendly is Your Mother’s Day Menu? Is Factory Farming Turning Cows into Cannibals? Is It Okay for Sanctuaries to Give Hens’ Eggs to Donors? Killing Animals: Justified By Imaginary Solutions to Suffering? The Nightmare Before Easter is Upon Us! The Prevention of Cruelty to Farm Animals Act sounds like a great idea. But is it? What is it? Vegans Don't Eat Eggs. Period. What Do Backyard Chickens and Factory Farm Chickens Have in Common? What’s the Bird Flu News — “Millions Dead” or “Eggs Prices Could Increase”? Which Eggs Are Truly Ethical to Eat? Which Is Worse For The Environment - Poultry Or Beef? What’s Wrong with Backyard Eggs? Why Are We Afraid of Radical Change?